Whiskey Barrel Aged | Weyerbacher Brewing Co.
From 11/13/13 notes. Had this on tap at Ginger Man in NYC; menu said it was from 2012 and I had never heard of it. 12 oz. pour in a snifter. a - Pours a deep mahogany brown color with one inch of light tan head and moderate carbonation evident. Leaves some light lacing on the glass. s - Smells of sweet bourbon, oak, toasted malts, roasted malts, chocolate, and some caramel malts. Bourbon is up front but doesn't dominate, and allows a lot of chocolate and caramel to come through. Light vanilla on the end too. t - Tastes of sweet bourbon, roasted malts, cream, vanilla, chocolate, oak, caramel malts, toasted malts, and dark fruits. Bourbon up front again but more cream and vanilla here than the nose had. Not hot at all. m - Medium to full body, and moderate carbonation. No heat at all and very creamy; great mouthfeel. o - Overall I liked this one a lot; honestly, this is probably the best Weyerbacher beer I've had so far. Looks like last year it may have been hot but it is drinking great right now. A decent amount of bourbon up front but it is not hot and doesn't overpower it, and it has a lot of other falvors coming out. Smooth body, would love to have this one again. Bottle from a generous trader. Thanks man! Pours a murky dark brown with small yellowish khaki head. Aroma is nutty toffee, biscuit, vanilla, whiskey, chocolate, molasses. Very nice. Flavor is big nuttiness up front--pecans and hazelnuts--with a whiskey background, toffee, and a lingering pecan whiskey and dark fruit (almost a lingering Belgian dubbel flavor). Body is thin for a barrel aged brew but manages the barrel well. More than adequate carbonation, and a sipping beer for a nice Friday night. Not bad. Another quality brew from weyerbacher. Pours a nice dark small head with a good whiskey barrel aroma. I really enjoyed this brew as I feel it meshed fairly well. I would purchase again if it were available. I feel Heresy is better but this is still a quality BA beer. Bottom LIne: Decent BA brew! 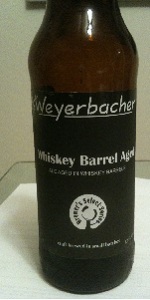 Whiskey Barrel Aged from Weyerbacher Brewing Co.